BRAKES | IMPORTANCE - Brakes are pretty much the most important safety device on your car. If you've ever partially lost your brakes in the past, you’ll agree that it’s not something you want to experience again. Inspecting your brakes twice a year for wear and damage can protect you and your passengers. Additionally, it will also help save you money by catching any damage before it becomes too costly. The master cylinder, the heart of the vehicle's braking system, holds the brake fluid when it is not being delivered to the brakes through the brake lines. If brake fluid leaks because the master cylinder is worn or brake lines are plugged or broken, the fluid cannot be delivered, and the brake pads will become ruined. 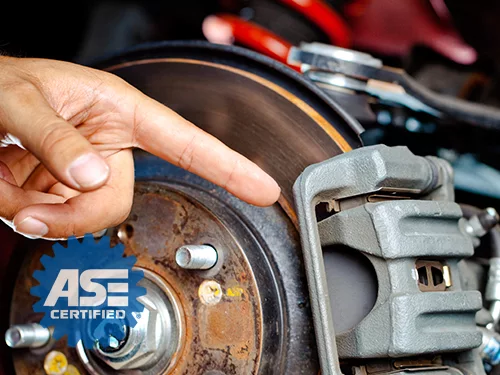 The brake fluid itself can become dirty or contaminated as it draws rust-causing moisture and picks up other debris, or it can break down from excess heat. Clean brake fluid is either clear or slightly yellow, while dirty brake fluid may be brown or even black. Old and dirty brake fluid can damage ABS brake systems internally. The brake lines connect to the master cylinder through a combination valve, which combines a metering and proportioning valve. It regulates the pressure on the front and rear wheels to make sure both sets of brakes are applied simultaneously. A malfunctioning combination valve may cause the wheels to lock up. Brake pads and shoes can be made of ceramic, metal or organic materials, while the disc rotors and drums they press against are made of metal. 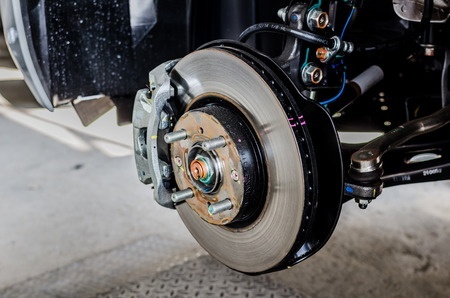 Because the pads and shoes create friction to stop the car, they gradually wear down over time and may wear away completely, letting the metal of the calipers and cylinders they are attached to grind against the rotors and drums and damage them. 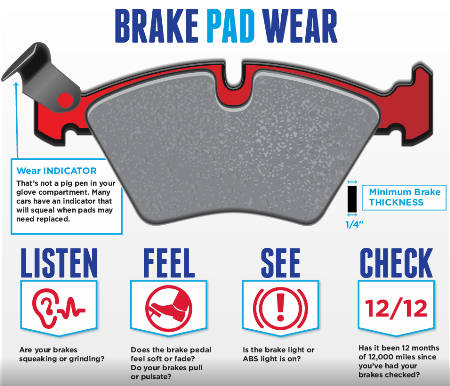 Some pads have a metal strip attached that sounds a warning whistle when the pad becomes too worn, but this strip sounds only when the car is in motion and the brakes are not applied. Sparks Tire & Auto of St. Charles Missouri provides complete brake system service including brake pads & rotors. When it comes to brakes, Sparks Tire & Auto knows your brakes are the last thing you have time to worry about. 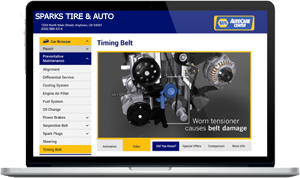 Our Brakes & Auto repair specialists make sure you leave our service center in St. Charles, MO. with peace of mind knowing that your car received the best care, all at the right price! Brakes are often overlooked and taken for granted until you have a significant problem on your hands. When it comes to the most important safety mechanism on your vehicle, letting problems go until that system no longer functions properly is a recipe for disaster. Don’t ignore the warning signs of impending brake failure, keep your braking system functioning at its peak performance. 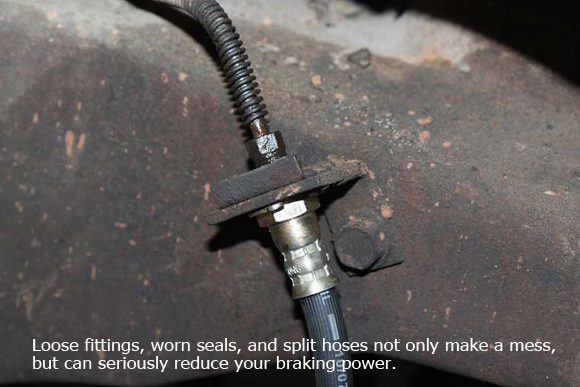 The following is a list of the top ten warning signs that your braking system needs servicing. If you have any questions or concerns at all, call Sparks Tire & Auto of St. Charles, MO. at (636) 946-5900. A soft, spongy feel in the brake pedal is a sure sign of a problem in the hydraulic system. Issues such as air in the lines, failing calipers or wheel cylinders, or a weak flex line can feel soft when you hit the pedal. Your brake pedal should be firm and the brakes should feel solid and apply gradually. When the pedal is soft and spongy, your braking system is likely to fail soon. It could be as simple as needing more fluid in the master cylinder. If the brake pedal is hard to push, the problem is most likely in the power assist mechanism. There are two types of power assists – vacuum and hydraulic. Most cars and trucks use a vacuum booster to provide braking assistance so that the driver doesn’t have to exert as much effort on the brake pedal. Some heavier trucks, and certain turbocharged vehicles use what is called a hydroboost instead of vacuum to do the same thing. A hydroboost uses hydraulic pressure from the power steering pump to assist the braking function. When these systems go down, the brake pedal is hard to push, but the braking system is otherwise functional. If the brakes do not work and the pedal is hard, then there is likely a mechanical issue between the pedal and the master cylinder, such as an obstruction or broken connecting rod. Power assist failures in vacuum systems are typically caused by a loss of vacuum (disconnected, split or block vacuum line) or a tear in the diaphragm of the brake booster. Hydraulic boosters can seize internally, leak, or run out of fluid. If the the rest of the steering system is functioning normally, but the hydraulic brake booster does not, then the booster itself is likely the culprit. The hydraulic system is complex, with lots of lines running to the various components, especially in vehicles with ABS. A leak in any one of these many connections will lead to a loss of fluid and air in the system. Eventually, the braking system will fail altogether. The most common leak-prone areas are at the wheels and the rubber flex lines between the hard line and the brake calipers. 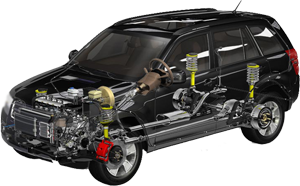 In rear wheel drive vehicles, there is flex line that runs between the body and the rear axle as well. Brake fluid varies from clear to rusty orange, depending on it’s age and condition. The fluid is very thin and quite slippery. There is slight odor to it. Look for the tell-tale sign of wet inner tires for caliper/wheel cylinder leaks. Brake fluid is not good for paint, another sign of a leak is wrinkled paint near a brake line connection. 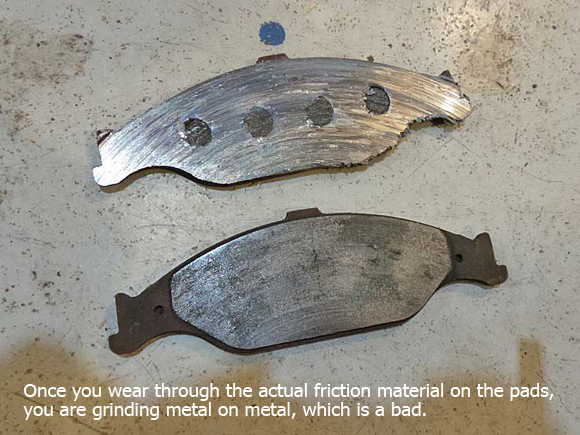 Once you wear through the actual friction material on the pads, you are grinding metal on metal, which is a bad. If you hear noises when you hit the brake pedal, you likely have a mechanical issue with the braking system. Grinding is a metal on metal sound that means the brake pads/shoes are worn out and the base pad is grinding on the rotor. Once you get to this point, braking performance is seriously diminished and the rotors are actively being destroyed with every press of the pedal. 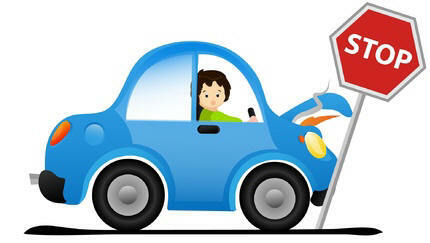 Bring your vehicle to Sparks Tire & Auto in St. Charles, MO. as soon as possible to avoid further damage and an unsafe condition. 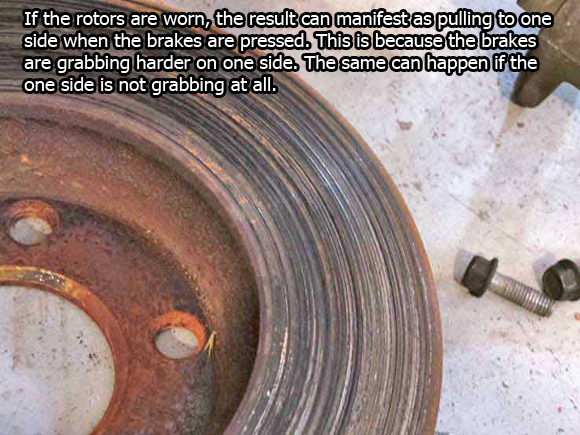 If the rotors are worn, the result can manifest as pulling to one side when the brakes are pressed. This is because the brakes are grabbing harder on one side. The same can happen if the one side is not grabbing at all. As you press the brake pedal, all both left and right sides of the brake system apply equally. If there is an issue with one side, then your vehicle will pull to one side as you use the brakes. This could be a simple adjustment, but most likely the brakes are wearing more on one side than the other. A failing wheel cylinder or caliper will result in uneven wear and application of the brakes. Another issue is worn rotors eating up the pads and grabbing or slipping. Another potential issue is worn out brake fluid. Brake fluid absorbs moisture from the air, which eventually degrades it's performance. These test strips show you if your fluid is still good or needs changed. Another potential issue is worn out brake fluid. Brake fluid absorbs moisture from the air, which eventually degrades it’s performance. These test strips show you if your fluid is still good or needs changed. If your vehicle is taking longer to stop that normal, then you are experiencing brake fade. This can be a short-term problem or a long-term problem, depending on the cause. An example of short-term fade is driving on a curvy road, such as coming down a mountain. Riding the brakes will heat up the pads and rotors, making them less responsive. Once they cool down, they can return to the original or near original performance. Eventually, the fade becomes permanent and the only solution is to replace the pads and/or rotors. An alternative to riding the brakes in these situations is to downshift the transmission and let the engine slow the vehicle. When the brakes have been heated up too much, the rotors can develop hot spots, which when cooled, contract more than the rest of the rotor. The result is a warped brake rotor. Once this occurs, every application of the brakes sends pulses through the brake pedal or steering wheel. These vibrations can also be a sign of poor steering alignment, so you should schedule an appointment with Sparks Tire & Auto in St. Charles, MO. to get the problem checked out. A dragging brake shoe on the drum can lead to reduced performance in all aspects- acceleration, cruising and braking. This drum had two grooves worn into it. Hit the gas and the engine revs, but the vehicle is not pulling away as fast is should? The problem could be a caliper or drum hanging up. If you let off the gas (after reaching 35 MPH or so) and the vehicle slows down much faster than it normally does, this is a sure sign of a braking issue. Road grime buildup and faulty caliper/wheel cylinders are the typical cause of this issue. If you smell a funky burning odor when you hit the brakes, you have a problem. Overheated brakes smell quite bad and are a dangerous situation. If your brakes are smoking, you are burning the pads. Overheated pads develop a glaze on the surface that is slick, and your braking performance will be be greatly reduced. This is a component of brake fade as discussed earlier. Any time the brake warning light comes on, you need to pay attention. There are two brake lights – the main system and the ABS system. ABS components can fail and allow the rest of the system to function normally, but the main braking warning light means that vehicle has most likely experienced a failure in the hydraulic system and needs to be serviced immediately. DO NOT PANIC. Take a breath, focus and calm down. You can’t do anything if you panic. Pump the brakes. If the pedal suddenly goes to the floor, there is likely a broken line. Pump the brakes repeatedly. Most vehicles have separate front and rear systems, so a broken line on one half allows the other half to still work. Pumping the brakes can build up pressure in the system, allowing the brakes to work. Downshift. Let the engine do most of the work. If the brakes have failed, you need to get off the road. Downshift through the gears to reduce your speed so that you can get slowed down before trying to get stopped. E-brake. Unless you have to, don’t just yank the handle or stomp on the e-brake, this will lock up the rear brakes send you in a spin if you are at speed. Instead, use the e-brake to scrub off speed slowly. A hand brake is better for this, but that all depends on your vehicle. If you moving slower than 30 or so, a full application of the e-brake is less likely to send the vehicle into a spin. Controlled swerving. To scrub off speed, you can use the steering wheel to swerve the car side to side, slowly and deliberately. Don’t just yank the wheel one side to the other, that will cause a wreck. Once you get the vehicle slowed down, you can make harder turns to bring the vehicle to a stop. You are looking for a slow weave, not a hard turn. If you are in a runaway vehicle, turn on your flashers and honk your horn to alert other drivers that you are in an emergency situation. Most brake failures occur quickly and in situations where you need to stop immediately, so practicing these steps will help you remain calm and get your vehicle as slow as possible before you have a collision, and they may allow you to avoid a wreck altogether. If you wait until you have a brake service problem, the solution will generally cost much more than if you catch it before you experience a failure. 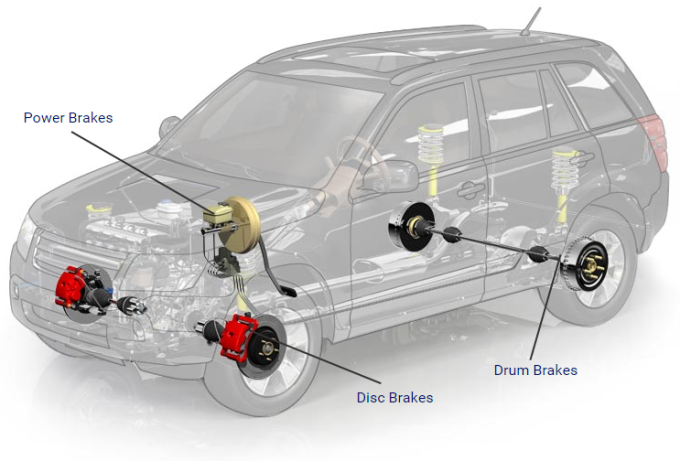 The braking system is the number one safety mechanism on your vehicle. Pay attention to the warning signs of impending doom, your wallet and life may depend on it. 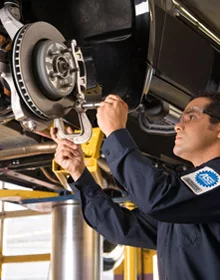 Bring your car or light truck into Sparks Tire & Auto at 1665 Scherer Pkwy., in St. Charles Missouri and we will examine the entire brake system of your vehicle. Worn pads and shoes replaced. Wheel bearings repacked as needed. Rotor & drum resurfacing (may need replacement if wear is excessive). Replacement of other components based on findings of inspection. Old brake fluid is replaced with fresh fluid. Road test to ensure entire braking system is operating properly.